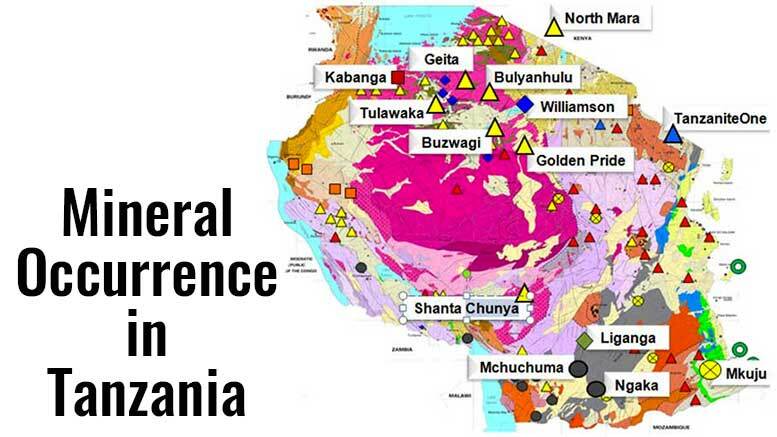 Mining in Tanzania includes metals (gold, iron ore, nickel, copper, cobalt, silver), industrial minerals (diamond, tanzanite, ruby, garnet, limestone, soda ash, gypsum, salt, phosphate, gravel, sand, dimension stones and lately graphite), and fuel minerals (coal, uranium). Mining and quarrying activities in Tanzania contributed 3.7% to its GDP with USD 1.78bn in 2014, compared to only USD 598m in 2009, representing a value increase of almost 200%. Based on Tanzania’s Development Vision 2025 plan, the mining sector is expected to account for 10% of the GDP by that year. Minerals export accounted for USD 1.37bn of the total value of Tanzania’s export in 2015 (i.e. 24%) with gold representing more than 90% of the country’s minerals export. The total value of Tanzania’s diamonds export was USD 61.7m, while other minerals export value was USD 61.7m. Tanzania exports gold mainly to South Africa, India, Switzerland and Australia, while diamonds are being exported almost entirely to Luxembourg. Gold reserves in Tanzania are estimated at about 45m ounces. Gold exploration has been centered mostly on the greenstone belts around Lake Victoria, where several large deposits have already been discovered and are being developed. Gold production in Tanzania stands at around 50t per year which makes the country the 4th largest gold producer in Africa after South Africa, Ghana, and Mali. While Tanzania’s gold production increased by more than 700% over the past 25 years, from 5 to 40-50t per year, South Africa’s production of gold decreased from over 500t in 1990 to 140t in 2015. The Liganga project is expected to start operation by 2018–2019. Accordingly Tanzania’s commercial production and exports of iron are set to start in 2018–2019. Diamonds in Tanzania are found mainly in the Williamson diamond mine, which is located south of the town Mwanza. Petra Diamonds, through its subsidiary Williamson Diamonds Limited, holds 75% of the ownership rights over the mine, while the remaining 25% are owned by the Government of Tanzania. In 2015, the company produced 202,265 carats and plans to increase its production to 350,000 carats per annum in 2017. According to Petra Diamonds, the Williamson mine contains large diamond resources of approximately 38.1m carats. Tanzania produces a variety of gemstones, including amethyst, aquamarine, garnet, ruby, sapphire, tanzanite and tourmaline. Tanzanite is found at only one location in the world, the Mererani Hills of Manyara Region in Northern Tanzania. The production of tanzanite rose by 17% during 2008–2013, from 768t to 900t, while discovered reserves amount to 500m carats. Coal reserves in Tanzania are estimated at 1.9bn t, 25% of which are proven. Coalfields with the highest potential are Ketawaka-Mchuchuma in the Ruhuhu Basin, Ngaka fields in the South-West of Tanzania and Songwe Kiwira fields. Production of bituminous coal in Tanzania rose significantly during the 2010–2013 period, from 179t to 128,920t. Tanzania has found huge deposits of uranium mainly in Namtumbo (Mkuju), Bahi, Galapo, Minjingu, Mbulu, Simanjiro, Lake Natron, Manyoni, Songea, Tunduru, Madaba and Nachingwea. Currently (2016), the project maintains an active status since research and preparatory operations are under way. Russia’s Minister of Trade and Industry, Denis Manturov said that Russia hopes to start operating the Mkuju River uranium mine in 2018.